PARIS-“We have proved that it is impossible to bring Russia to its knees,” Putin declared after the assault on the Chechen hostage takers on Oct. 26. The “collateral damage” was 119 hostages killed, all by the gas pumped into the building or by the guns of the special forces. It was topped off by the execution of the 50 hostage takers. Putin thought that the danger to the unfortunate hostages was of little importance. For him, the essential thing was to take the opportunity to reaffirm his determination to win the war in Chechnya. Putin concluded his television broadcast Saturday evening [Oct. 26] by saying that “the terrorists have no future, but we do.” He obviously feared losing that future if he had not defeated the Chechen commandos. So, Putin’s destiny has become inseparably linked to the war in Chechnya. He came to power by “putting the boot” onto the Chechens. He can only hold onto to it by demonstrating his power. On Oct. 28, the Russian military in Ingushetia [the autonomous republic neighboring Chechnya] mounted a siege of the Chechen refugee camps. Since then they have been patrolling systematically among the refugees. The Chechen commando operation was crazy. The population of Moscow is not responsible for the war in Chechnya. The strategy of the Chechen commandos revealed their incapacity to find ways to break the Russian people from their government. The Chechen resistance is divided. President Maskhadov had forbidden any military action against Russians outside Chechen territory. But he does not have effective control of the military resistance. This action pointed up the despair of the Chechens. They are isolated. They are not getting any help from outside except from the Islamic countries. They have just been dropped by Georgia. Two hundred U.S. military advisors arrived in Georgia in May to train the Georgian army to fight the terrorists who are supposed to be hiding among the Chechen refugees in the Pankisi valley. Actual operations started in September, and Georgia is envisaging extraditing several Chechen refugees to Russia. The American secret services are reportedly using satellites to find Maskhadov, who is hiding in the Caucasus mountains along with the fighters, and handing over information to their Russian friends. Is Bush going to redouble his efforts after Oct. 23 to get Russian support for his war against Iraq in return for supporting Russia in Chechnya? In these conditions, Maskhadov is more and more dependent on those who have money within the resistance. And they are the Wahabite Islamists financed by Saudi money. Despite its tragic outcome, the commando action showed that the Chechen resistance is far from defeated. The Russian government is covering up the situation in the Caucasus. But there is no military solution to this conflict, either from a Russian or a Chechen standpoint. Only a political solution can make it possible to bring peace back to the region. The prerequisite for this is a ceasefire, the withdrawal of Russian troops, and recognition of the Chechens’ right to determine their own fate. The West’s policy (both of the U.S and France) of supporting a so-called anti-terrorist operation in Chechnya is giving grist to the mill of the forces the great powers say they want to combat-the Islamic radicals. Despite everything, Chechen society remains highly diverse and complicated. The influence of the Wahabites is far from predominant. But the great powers are essentially supporting a strong government in Moscow, which they regard as a guarantee of international stability and an underpinning for capitalist reconstruction of the economy in Russia itself. Solidarity movements of citizens and trade unionists with the Chechen people are absolutely decisive. Our governments are supporting Putin’s imperial policy. We will mobilize still more to offer democratic and secular aid to the Chechen people, to protect the refugees, and to assure the emergence of a political solution. 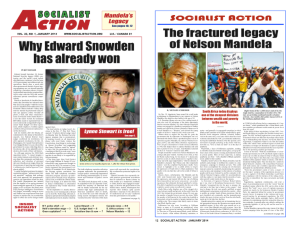 This article was published in the Oct. 31 issue of Rouge, the weekly paper of the Revolutionary Communist League (LCR), Socialist Action’s sister organization in France. November 1, 2002 in Europe. Who Gains From the Slaughter in Chechnya?